The blood supply to a tumour plays a crucial role in cancer development. A rapidly growing mass of cells needs a lot of nutrients and oxygen to sustain its expansion. 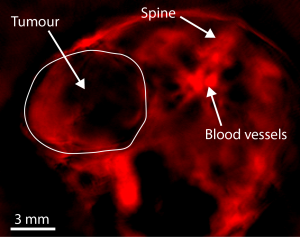 As it develops, the tumour sends signals to the body to produce more blood vessels, but the speed of its growth, faster than other healthy tissues, does not allow for development of a fully functional blood vessel network of arteries and veins. This results in a dense, leaky, dysfunctional network of vessels in the tumour. The tumour blood vessel network can vary strongly between different cancers, or even different areas within a single tumour mass, influencing the aggressiveness of the disease, stage of its development and potential response to treatment. Ability to visualise and measure the functionality of the vessel network could therefore provide valuable information to guide diagnosis and treatment planning for cancer patients. Current imaging techniques are able to measure the oxygenation and flow rate of blood, or the amount of oxygen in the tissue, but all have their disadvantages. Magnetic Resonance Imaging (MRI) based techniques suffer from low sensitivity and require a very expensive scanner. Positron Emission Tomography (PET) has low resolution and uses ionising radiation, which can be harmful to the patient. Optoacoustic Tomography (OT) is a new imaging technology that uses light to generate sound waves. The tissue, illuminated with a pulse of light, heats up by a very small amount, undetectable by the patient, but enough for the tissue to expand slightly. Repeated use of the fast light pulses causes vibrations of the illuminated area, which can be detected using the same technology found in ultrasound imaging, which is very safe and commonly used for monitoring pregnancy development. OT produces images like the example shown in Figure 1. Importantly for our study, by using different wavelengths of light, this method allows us to distinguish between oxygenated and deoxygenated blood in the vessels, and hence measure blood concentration and oxygenation in the tumour. In our study, we noticed that the changes in blood oxygenation with time after breathing pure oxygen (rather than just air, which is ~21% oxygen), can tell us about how well oxygen is transported through the vessels into different regions of the tumour. Figure 1: Example OT image of a cross-section through a mouse. The back of the mouse is at the top of the image, and the tumour is growing on the left flank. We can see that the middle of the tumour is relatively dark, as it is not very well vascularised compared to healthy tissue. In our experiments, we compared the blood vessels in two different prostate tumour types grown in mice (called PC3 and LNCaP). The mice were placed in the OT scanner, and given alternately air and oxygen to breathe, in order to modulate the blood oxygenation in their whole body. This way, we could look at and compare various parameters, including the blood oxygenation and its changes in time, which proved to show very interesting patterns (see Figure 2). What we found was quite surprising. While the blood oxygenation itself does not seem to be related to how functional the tumour vessels are, the increase in oxygenation following the change of gas is very meaningful! The two tumour types used showed a clear difference in this parameter. Figure 2: Oxygenation changes in the two tumour types. In panel A we can see the different way the blood oxygenation response distribute in the tumours. The active areas, with high change (white arrows) in the PC3 seem to be mostly on the outside, while the inside shows a low response (black arrow). In the LNCaP, the regions of high and low response seem quite randomly scattered around the tumour. In panel B we can also see that the two tumour types on average show very different oxygenation changes (each point on the graph is one tumour). To check if the imaging readings were reliable, we compared them to a well-known measure, which in this case meant injecting a coloured dye. 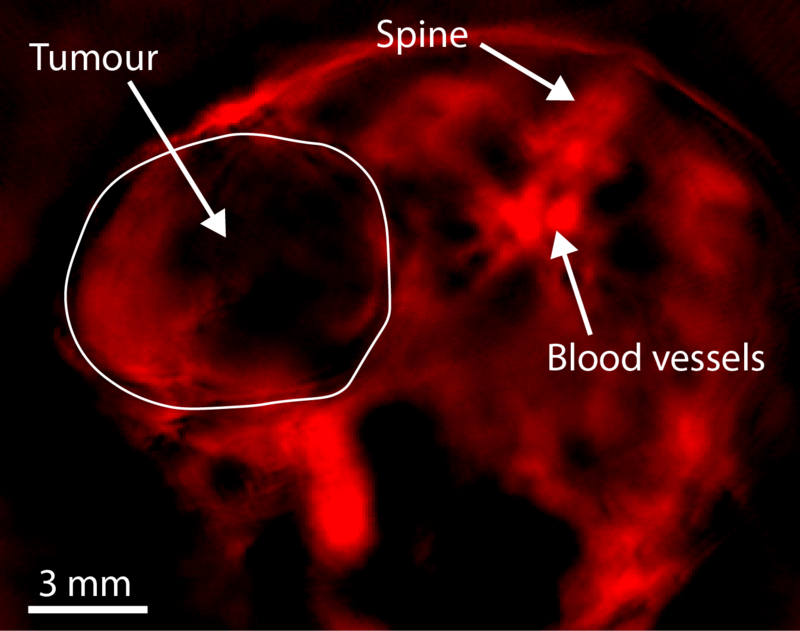 After circulating in the tumour blood vessels and making its way into the tissue, the dye could be visualised under the microscope, showing how well the vessels work. Importantly, we were able to show a clear correlation between the changes in blood oxygenation, as measured by OT, and this well-known measure of vascular function. We hence proved that OT can be used to indirectly image how well the tumour vessels are working. Before these findings can be translated to the clinic, a significant amount of work is still to be done. Most importantly, the results must be validated in a range of different tumour types. Nevertheless, our work shows that Optoacoustic Tomography may in the future be used as a safe, easy, inexpensive and non-invasive method to evaluate cancer prognosis and response to treatment.